Artists allowing Pinterest to scrape their content looks like a personal decision. On some levels, it is; an artist can evaluate how much referral traffic they are receiving from Pinterest relative to the number of infringements they allow, and decide whether that's worth losing control over the distribution of their images and websites everywhere hotlinking these pictures with links back to Pinterest. 10 referrals from Pinterest per month. In this simple example, referral rate is 1% per month, or 0.01 monthly visitor per infringed image. In other words, the content creator must allow 100 units of infringement in order to gain one extra visitor per month. That takes care of the personal decision aspect. Another important consideration is a collective one. 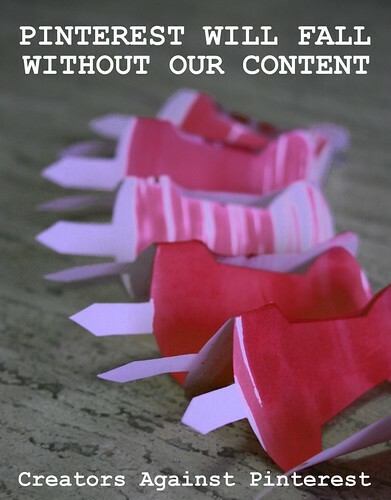 Should the community of content creators, as a whole, embrace Pinterest? If people are looking for your content as text, or images, they have search engines at their disposal and they should find you directly, not with Pinterest as an intermediary. You are competing with Pinterest for a most valuable resource, visitors. Visitors can be expressed as the total number of time people spend engaged on the internet. This is a finite resource. The more visitors are engaged on Pinterest, because the content is there, the less motivated they are to find you with search engines, or even follow a link to your site from Pinterest. The more content we let Pinterest get away with, the fewer visitors ALL CONTENT CREATORS will have to share, with Pinterest getting, by far, the largest chunk of the pie. Some years ago, a webmaster could create a craft website, work on it for some years, and expect a reasonable amount of success and rank in search engine pages. They were then competing against other content creators with similar resources. Now, a webmaster wishing to launch a craft website needs to compete not with his/her peers, but with Pinterest, a place where everyone's best work is now aggregated. Success stories are expected to be extremely rare in such an environment. If enough content creators say "yes" to Pinterest, all of them will lose out in the short term, and more devastatingly in the long term. This is a heavy price to pay for an illusory trickle of traffic. If it sticks around long enough, I can see Pinterest taking a slice out of the blogosphere — specifically, blogs that are set up for the sole purpose of sharing pictures. Why manage an entire website for pictures when you can just point picture to your Pinterest collection? You don't need a crystal ball to see that one coming. We can do our share to stop it. We can stand united against Pinterest, and contribute to keeping the internet an environment where citizen-publishers can make a living without being robbed by crowdsourced scrapers like Pinterest - like it's meant to be. EDUCATE fellow artists wherever opportunity arises. REMOVE all our pinned content via DMCA notices. Yes, this is very much the same principle that Amazon's affiliate program applies to the distribution of its product images. They grant permission to display these images inasmuch as they lead back to the corresponding sales page. It's an important distinction that makes The Fancy a more legitimate project than Pinterest. The Fancy is geared towards showing products for sale, which is much more likely to be a legal use of images. For POD sites, there is a fine balance between promoting your designs on Pinterest where they are more likely to be looked at than purchased, and decreasing the value of that design because "everyone" has laid eyes on it already, and reducing its novelty. It's difficult to know which way the scale will tip. The Fancy might actually the a better marketing tool, with Pinterest a toss up, either way.